Namukasa Kasolo Tayiha, at just 10 years old, is investing in her own education and future after participating in The Hunger Project Uganda’s training on microfinance at her primary school. These workshops, led by volunteer animators, encourage youth to start saving and are often the first steps towards economic empowerment. In Uganda, microfinance supports the reduction of poverty by improving people’s standards of living and economic self-sufficiency. It also offers a pathway to education, health care and gender equality. While it is often adults who make these types of investments, Namukasa– who lives in the Iganga district of Uganda–was ready to start planning for her future after participating in a workshop! The teacher inspired Namukasa to immediately open a savings account with her community’s cooperative. She then started putting part of her lunch money into an account on a weekly basis. Namukasa’s father, Kasolo Isma, was happy to learn of his daughter’s initiative in planning for her own future. “This is something new that I have not heard of happening in Iganga,” he says. “When Namukasa told me she had registered with the bank to start saving, I was very happy and I am currently thinking of ways to ensure her savings grow.” Kasolo Isma says he is very proud of his daughter and is now sharing the news with other parents in the community. So far, Namukasa has managed to save 75,210 shillings ($27AUD) in her account and tries to deposit between 500 to 3000 ($0.20 to $1.11 USD) shillings a week. 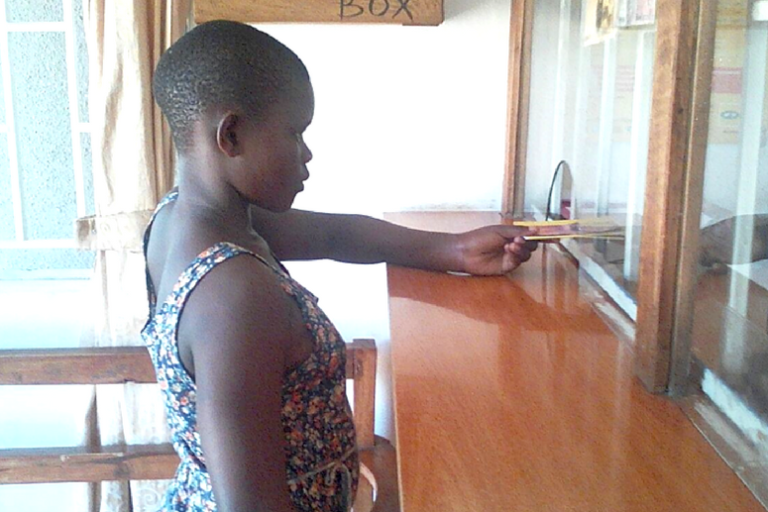 Even when Namukasa is not able to make it to the bank, she uses a savings box from The Hunger Project-Uganda to deposit money into. This is just the beginning for Namukasa– one day she hopes to become a nurse while continuing to save for her future!